Love my seeds. They make my food. Hate, hate, hate the little paper packets out in the garden. They spill, blow over, get wet, and otherwise lack field-worthiness. But the paper packets are compact, easy to stack and contain a ton of useful information that I don’t want to discard. Things like tomatoes and squash get planted once a year, so sorting through those packets is just an annoyance. For the succession plantings, it is a pain that leads to procrastination, which leads to not enough greenery a couple months later. Honestly, if it takes longer to get out the seeds and put them away than to plant another dozen lettuces, I’m going to put it off. How to organize this mess today so we have something to eat in August? After many failed experiments, I have settled on something that works for me. 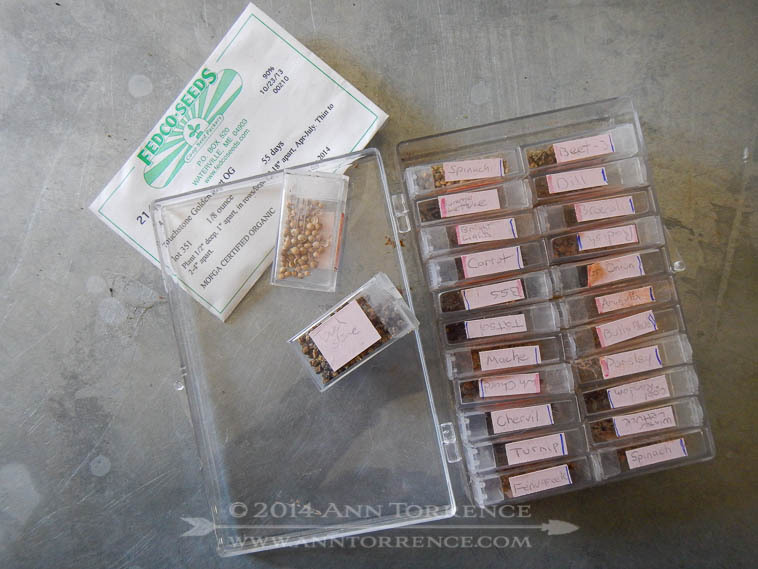 I use a plastic photo organizer to file our main stock of seeds in their paper packets. I cut down some card stock to make dividers, like tomatoes, brassicas, squash (it’s not perfect: does kale belong under “greens” or “brassicas?”). The plastic bin lives in the refrigerator. For the succession crops like greens, carrots and beets, I bought this bead organizer at a craft store, probably JoAnn’s. The lid comes completely off each little vial so it’s easy to pour seeds from the packet to load, but there’s also a flip top that lets out just a few seeds at a time and stays attached to the vial so I don’t drop it in the dirt. Sometimes I dump in an entire packet of seeds at once, sometimes just an amount I think I’ll use in the next few weeks, because this container doesn’t get stowed in the frig as reliably as the larger bin. Heat is not a friend to a seed’s longevity. Some of my seeds are five years old and germinate just fine, which I attribute to keeping them dry and cool. The vials can go out in the garden in a pocket if I just want to plant one or two things, but the whole organizer fits in a cargo pocket too. I labeled the vials with some removable tape. The seeds are protected from getting wet, and I am much less likely to waste a bunch to spillage. The rest of my seeds stay more stable because they don’t make as many trips out of the frig. But mostly it’s just dang convenient not to fiddle with the packets. It’s a simple thing that keeps things streamlined, but it works. We have way too much going on right now to do things the hard way.